Don't miss the BIG giveaway at the end of this post. 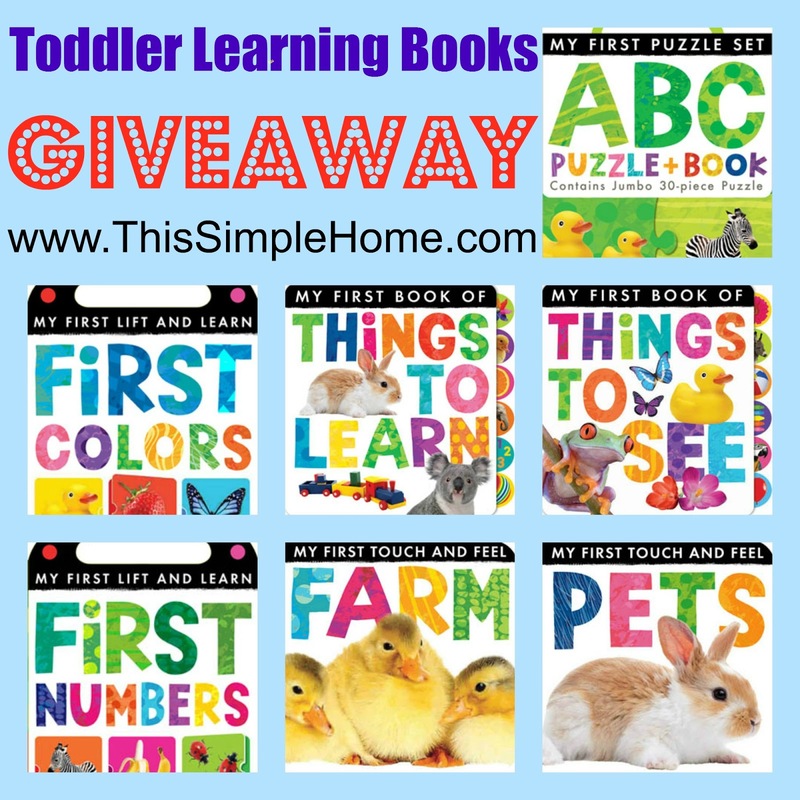 Whether you have children, grandchildren, or give them as baby shower gifts, you don't want to miss the great books that one of you will win! We have been enjoying more books, courtesy of Tiger Tales. I already shared with you the learning books that are great for promoting language (and a set of those will be given to one of you), but today I want to tell you about a few of their spring board books that we have been enjoying. Little Sister (18 months old) repeatedly asks for That's My Mommy! by Ann Hodgman. Different animals are portrayed throughout this book showing and telling the special ways moms show love to their children. I think my favorite is "My mommy wakes up when I do." The illustration shows the little bunny bouncing on the bed while the mom looks on with a smile. (Maybe soon a certain someone will sleep through the night, every night!) This would be a great gift for a mom...and That's My Daddy! would make a great Father's Day gift, too! My 4 1/2 year old son's favorite is It's Spring Time! Written by Elizabeth Bennett, it's a cute padded board book that celebrates all of the changes that take place during the spring like cleaning, growing, nesting, and playing. This sturdy book has the special enhancement of bits of glitter (that remain on the page, not on the finger) to highlight butterflies, flowers, and raindrops throughout the pages. Little fingers go right toward them! GIVEAWAY Giveaway is now closed. Congratulations, Latanya! 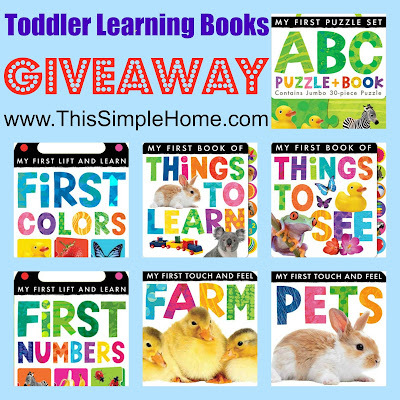 Tiger Tales has offered to give away at least six of the My First Learning Books pictured directly above in blue to one This Simple Home reader. I adore these books and think they are just fabulous. Even if you don't have children/grandchildren of your own, these will make a wonderful gift for others. Please read about the books that will be given away and then return to this post to enter. To enter, please leave a comment with your email address so I can contact you. Winner must be a US resident. ~ Follow through email, RSS feed, Facebook, or Twitter (see sidebar). Leave a separate comment for each way you follow. (Be sure to let me know if you follow under a different name.) Thank you for following! ~ Share about this giveaway and leave a link in a comment. (Instead of leaving a link, you can tag me with This Simple Home on FB and @thissimplehome on Twitter.) Of course you could blog about it, too. You can even spread the word through Pinterest! Thanks for spreading the word! ~ Look around This Simple Home. Your interest might be in recipes, homemaking, crafts, books, or faith. Pin a specific post other than this one and/or share about it on FB. (For those of you who do this regularly, you don't need to do it again.) Then return to this post and leave a comment with a link! Giveaway will run through Thursday, April 25th. The winner will be contacted by email and have 48 hours to respond. Random.org will help to choose the winner. Winner will be announced on Facebook and on this post. This giveaway is limited to the US. Thanks for entering and spreading the word! Thank you, Tiger Tales for providing the books featured for review purposes. All opinions are my own. Excellent and generous giveaway. I would bless my three year old nursery class with them. I follow you on all the above. :) Shared on fb and twitter. Both of my oldest two would love these! (Grasshopper enjoys teaching Firefly). :) I'm sure it won't be long before our little one would, too, though. I pinned your "Star Wars Peg People" post. Awwww ... I'd love these as a gift to my cousin's new baby girl. They are adorable! Thanks for offering them. Tweeted and tagged you. Thanks!